You are here: Home / Ethnic Groups / The People of Sumatra / Who are the Bangka? The Bangka live on the island of Bangka in the South China Sea, off the east coast of Sumatra in Bangka-Belitung Province. Other Indonesians often visit this island because it has beautiful beaches. Inhabitants of the island are composed of two groups: those descended from the Malay and those descended from the Chinese. Both of these groups call themselves Bangka. Nevertheless, differences exist between the groups including physical traits, economic status, and place of residence. The Malay of Bangka are typically dark skinned and not very wealthy, tending toward poverty. Both groups tend to live in ethnic neighborhood clusters. The Bangka language is part of the Malay language cluster. The Bangka language is very similar to Indonesian, with a few minor differences. There are also some minor differences between the dialects of Bangka, but they are mutually intelligible. Many Bangka residents choose to move to other areas for work, particularly Jakarta and Palembang. Currently, livelihoods are hard to find with the decrease of tin mining and the increased cost of living in Bangka. Pillars of the economy are the rubber and palm oil plantations. These plantations operate using systems of direct receipt of the harvest by the owner, as well as sharecropping, where the owner shares the harvest with those who work the land. The line of descent is bilateral (traced through both parents). According to tradition, the newly married couple does not live near either set of parents. As a result there are many mixed marriages between the Bangka and other ethnic groups that have come into the area. This outside influence can be seen in their wedding customs. The engagement ceremony is typically done in a traditional singing dialogue. Islamic influence is evident in the wedding procession which is accompanied by tambourines and drums. A regional art form is sepintu segudan, a drama telling the story of the community working together to help one another. 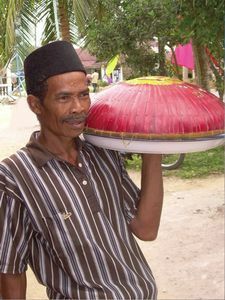 The Bangka Malay are Muslims, however they are not particularly orthodox in their beliefs. Mosques are not heavily visited during the sunset ritual prayers (sholat maghrib). However, during the more important Friday Prayer (shalat Jumat) the mosques tend to be full. There are not many Muslim educational institutions like Qur’anic reading centers, Islamic religious schools (pesantren) or mosque youth group activities. This shows that the Bangka profess Islam as their religion but are not especially strict about carrying out its requirements. Currently, the tin mining industry has decreased because little recoverable tin is left to mine. The government has put in place regulations which forbid community mining without permission. This decision has had a negative impact on the community because much of the population is dependent on income from tin mining. It is very difficult to find alternative livelihoods due to the people’s lack of skills. Because of this, the greatest need at this time is to develop the skills of the Bangka community. One possibility is developing their fishing industry, which to date has not received much attention.